Tables are used to organize the contents of a document and to present information in rows and columns. 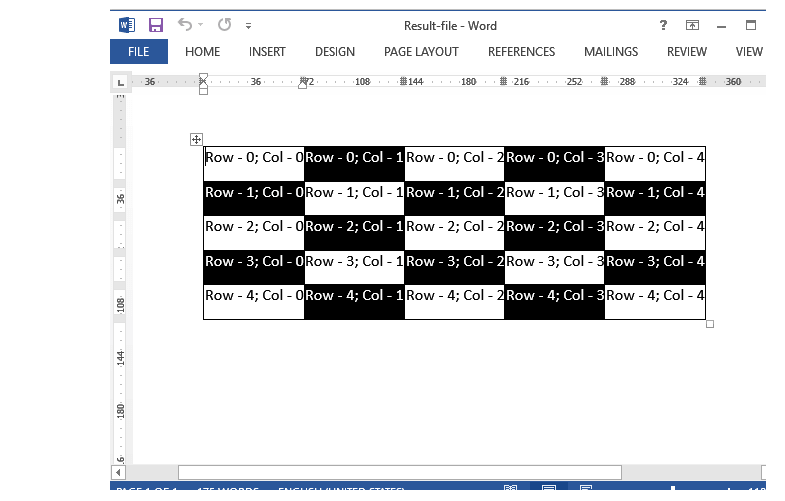 In this code example, we create a document with a table of 5 rows and 5 columns. /// Creates a new cell within a table and fills the it in staggered order. /// Creates a new document with a table. // Place the 'Table' at the start of the 'Document'. // By the way, we didn't create a 'Section' in our document. // As we're using 'Content' property, a 'Section' will be created automatically if necessary.
''' Creates a new cell within a table and fills the it in staggered order.
''' Creates a new document with a table.
' Place the 'Table' at the start of the 'Document'.
' By the way, we didn't create a 'Section' in our document.
' As we're using 'Content' property, a 'Section' will be created automatically if necessary.